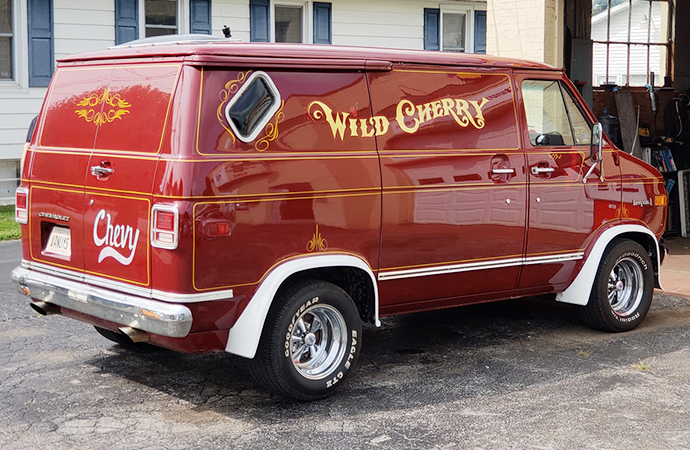 An Illinois man who gained some fame in the car world for restoring the Wild Cherry van that appeared in a 1970s B-movie has been charged with stealing the very vehicle that made him famous. The Belleville News-Democrat reported 39-year-old Chris Carter was arrested at the Madison County Courthouse during his divorce hearing. He was charged with two felony counts of taking a vehicle without consent and misdemeanor trespassing by driving on private property. The issue at hand is how Carter came to be in possession of the Wild Cherry van that appeared in the 1979 film Van Nuys Blvd. He said he first saw the van in a photo two years ago. The vehicle was sitting in a field, had a tree on top of it and, at some point, was singed by a wildfire. It took a year, but the former body shop employee eventually figured out where the van was located near Lancaster, California by using Google Maps. He and a friend drove 1,900 miles and asked around about it. Carter said locals told him the van was “abandoned” and one opened a gate to the dirt road that led to the van. Carter and his friend loaded the van on a trailer and drove off. “We didn’t know it was missing,” Laura Godin, who co-owns the property where the van was left, said. She said her husband, Steven, bought the van in 1980 and the couple had dreams of restoring it. Godin filed a stolen car report but acknowledged that Wild Cherry had not been registered since the early 1990s. While Godin sought the allegedly stolen van, Carter performed an extensive restoration that he documented on Facebook. Enthusiasts monitored the progress and a GoFundMe for the project raised nearly $6,000. 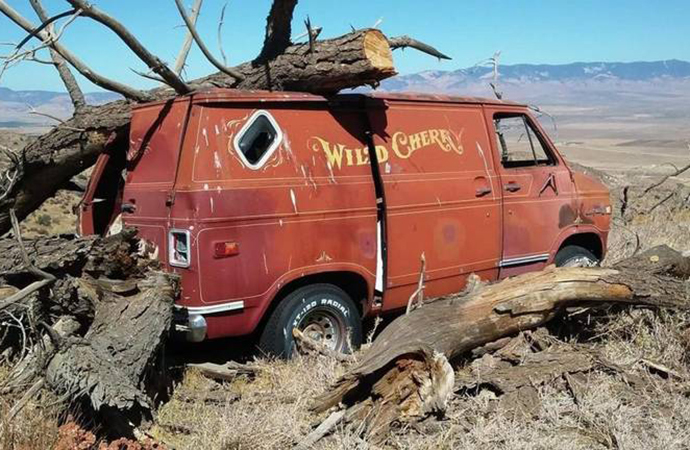 And despite the ongoing legal matter, a Carter-driven Wild Cherry led a caravan to Los Angeles in September, has spoken about how the restoration story would “make a great movie” and filed a trademark on the words Wild Cherry. Carter sells memorabilia with the van’s name on it. Carter’s bond was set at $25,000 and he will likely have to travel to California for court proceedings. The current whereabouts of Wild Cherry are unknown. Should he be found guilty, Carter could face more than four years in prison. The divorce hearing was postponed until November. Personally I feel that since the Van had not been registered since the 1990’s and was abandoned. He (Carter) did attempt to find the owner of the property and was led to believe it was some one else, I can not see any charges that he is charged with as being found guilty. The so called owners (Gooding) are now crying fowl when in fact they most likely had NO intent of doing any thing with the van. AND they will get the van back in fully restored condition, free. I think that if they want it they should buy it from Carter for the amount he spent on its restoration and up keep. After all they did not do any thing with it at all. Just my opinion. They thought so much of the van they left it abandoned in the field. I don’t think so. Fairly obvious I would have thought that he did not feel he was stealing it giving the identity of the van is 100% obvious and is being publicised in the media… not exactly changing colour and hiding it. Certainly looked dumped and yes they should have asked property owners who I guess now have a free restored van. Four years jail ??? How about a stern chat about asking first. The "owners" apparent "sentimental" value didn’t mean a thing to him for 20 some years. it was abandoned – even if on his own property. at the worst Carter should have to pay the reasonable value of the vehicle when recovered, which would be about a buck and a quarter, and that would be the end of it. at the least it would show people that they can’t just put a vehicle out in a field and let it rot. take care of it, or lose it. And your "opinion" Robert, shows a liberal view and disregard for law. It also shows a disregard for private property, not owned by you, abandoned or not. Laws cover every aspect of this scenario…listing them for you would make you "cry foul" as you, apparently, are clueless of many things, legal and/or not (my "opinion")……..and I’d better lock down that 1964 Karman Ghia that has been sitting on my land (land looks abandoned….Robert sez GO FOR IT ! )for years in the country while you’re around. Well Aloyisus, I think Robert has a good point. There is a LOT of open land in Calif. and a lot of abandoned vehicles. It could easily be argued that the van had not been registered or driven or maintained for so many years that taking it should not be considered vehicle theft. This argument carries further weight since the van would have had little value. The owners crying about it being gone is total bull. They want a restored van for nothing. They should be charged for polluting the environment considering the oil in the engine and trans. had in all probability leaked out along with the antifreeze. Great sentimental value but sitting outside rotting with a tree on top. I guess these folks can’t believe their good fortune that someone rescued it, restored it and now they’re getting it back without putting a dime in it. He should take it back to the way it was and where it was, dump a tree on it and let them enjoy it the way they left it. No harm no foul. I totally agree! If you had that much sentimental value for the van, why in the world would you leave it out in a field to rust and possibly get burned up? This guy just wants what someone else did all the work for. I agree with the other Comment: This vehicle was sitting rotting for decades in a field clearly abandoned. Sounds to me like the "owners" are trying to take advantage of the person who rescued this car from its eventual demise and restored it. You have got to be kidding. They stole it. Took it from someone else’s property. Abandoned or not, you would have to be pretty stupid to open a gate and go in and take a vehicle. He goes to jail and the van is returned. Wow, following the law. Call me old school. I was wondering how Carter was able to get a Pink Slip on a car that was reported “Stolen?” Did he file the proper paper work? Go through a waiting process for VIN background check? If the VIN came back clean and had not been registered for decades, I would assume once CA issued the pink slip, the person in the wrong is CA MVD/DMV. Also CA would have wanted back payment for a vehicle not registered for decades. If it had not been registered in over 10 years I believe it falls off the DMV computer. At that point you have to get a headlight alignment certificate and take it to the DMV office for them to inspect the vin plate and they register it in your name. Ive done this…however I did pay the owner for the car before taking it. Tough call..Id say since the true owners wanted to restore it they should pay the man for the restoration. Seems fair and pretty straightforward. As it was sitting I would not have given scrap money for it. That was a 300 dollar POS. at best. Isn’t that the way it usually goes. Someone try’s to do the right thing and bring history back to this f upped world, and someone else wants to profit from it. They should talk it out for there both interests at heart. It could make them both money if they thought about it for 2 seconds. Not hard to figure out. Marketing!! And once again we are reminded of the importance of vehicle titles. I’ve personally passed on some very tempting vehicles due to the "no title", "bill of sale only". It has so much sentimental value that she didn’t even know it was missing. Lifesaver might have an issue with his trademark application, along with funky white boy. Owners should be arrested for neglect. In my opinion, the folks that claim the van was stolen and having the van sitting rotting away. They did not have too much interest in the van. Now that the van is fully restored–they want the van back. Hmmmm. Sounds fishy to me.